K and I ended up close to a fire on Oxford Street yesterday. We had just had lunch at EAT. 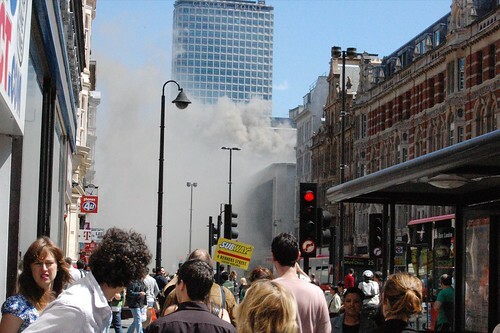 and were heading towards Oxford Cirkus when we saw thick smoke behind us, coming from a low building. People tried to decide whether to run away or move closer to watch. At that point it looked like it might develop into something big. Police were there early, but the firetrucks took some time. 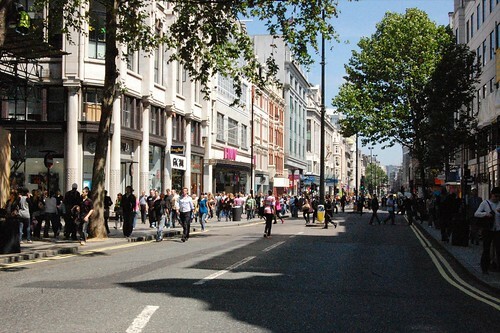 It’s not easy getting through the Oxford Street traffic, I guess. So the police decided to shut it down. In itself a hard task. But after a few minutes there was no traffic going east. And later on they closed down both directions. While this work was on, the smoke had got thinner and blue. Different material burning, we guessed. But in the end, the fire seemed to die by itself. 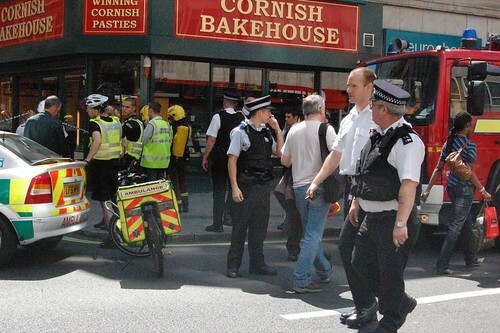 By then three firetrucks, a number of policecars an ambulance and an ambulance bicycle (!) had arrived. A piece of everyday drama unfolding before our eyes. I took a lot of photos, of course. Here’s my London set on Flickr.